Until now, studies of urbanization in India have been based only on official urban figures as provided by Census surveys. This approach has inevitably introduced several avoidable biases into the picture, distortions which are further compounded by numerous regional inter-Census adjustments. A much sounder option is now available in the Geopolis approach [www.e-geopolis.eu], which follows the United Nations system of classifying as urban all physical agglomerates with at least 10,000 inhabitants. From this standpoint, the Indian scenario exhibits all signs of a much-diffused process of urbanization rather than a major demographic polarization led by mega-cities. While 3,279 units were officially categorized as urban, the Geopolis criterion has identified 6,467 units with at least 10,000 inhabitants. Moreover, Geopolis estimates the urban population at 37% for 2001, which is 10% more than the official Census estimate. In absolute terms, this difference accounts for 100 million inhabitants. Brought to light by both physical identification and gradation of the census units of all localities as well as a study of the morphological profiles of individual agglomerates, a major finding reveals a greater spread of the country’s metro and secondary cities than previously believed. Statistical and political considerations have obscured the emergence of small agglomerations of between 10,000 and 20,000 inhabitants. This omission can only be seen as a gap in the national policy on planning and urban development. In other words, the country seems to be firmly headed toward an extended process of metropolitanization alongside diffused combinations of localized socio-economic opportunities, clusters, cottage industries, and market towns partially interlinked by developmental corridors. Far from a dual model of modern versus traditional, urban versus rural, metro city versus small town, the Indian subcontinent features many sub-regional settings which converge, overlap, and diverge. This study of the distribution of current and emerging agglomerations challenges the pertinence of the urban/rural divide. 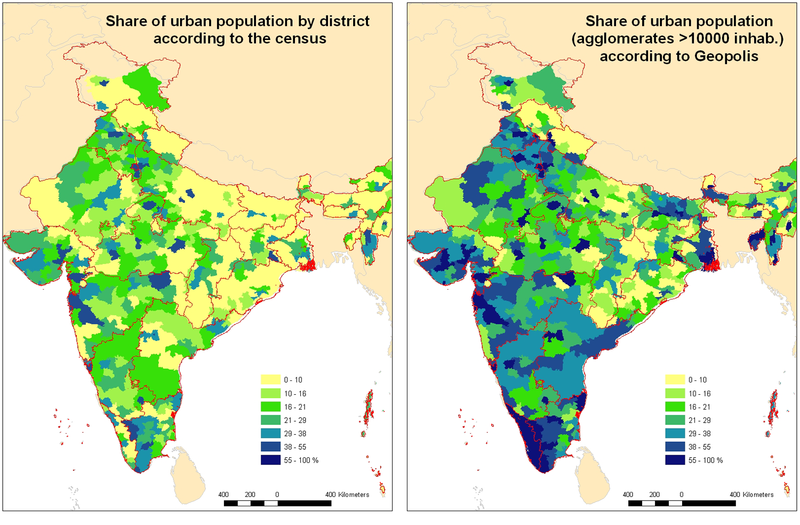 Jusqu’à présent, les analyses de l’urbanisation en Inde se sont fondées uniquement sur les données officielles issues des recensements de la population – une approche qui biaise considérablement les résultats. La catégorisation urbaine statistique et administrative est, en fait, affectée par de nombreux arrangements régionaux et entre les recensements. En s’appuyant sur l’approche Geopolis, une vision alternative de la distribution actuelle du peuplement urbain est proposée. Elle suit les recommandations des Nations Unies pour assurer la comparaison de l’urbanisation dans le monde : toutes les agglomérations morphologiques comptant au moins 10,000 habitants sont considérées comme urbaines quelque que soit en leur statut officiel. Après la géo-localisation de la totalité des unités censitaires locales, puis la vérification des localisations et l’acquisition des contours morphologiques des agglomérations, il apparaît clairement que loin d’une remarquable polarisation par les plus grandes villes, l’Inde est engagée dans une dynamique d’urbanisation beaucoup plus diffuse. 6 467 unités avec un minimum de 10 000 habitants sont identifiées contre 3 279 ayant un statut urbain. Le taux d’urbanisation avec Indiapolis s’élève à 37% en 2001, soit 10% de plus ou 100 millions d’habitants qu’avec la définition officielle. A côté de cette émergence de l’échelon des petites villes, l’un des apports majeurs est la mise en évidence d’une étendue très nettement supérieure des périphéries des métropoles et des villes secondaires par rapport aux données officielles. Pour des raisons statistiques mais aussi politiques, la remarquable prolifération des petites agglomérations comptant entre 10,000 et 20,0000 habitants reste cachée : c’est un maillon absent dans les politiques urbaines. L’Union indienne semble s’orienter vers une métropolisation étendue associée à des combinaisons plus diffuses liées à des opportunités socio-économiques localisées des clusters, la présence de proto/micro industries, de villes de marchés le tout étant en partie relié par des corridors de développement. Sur l’immense et très divers subcontinent indien, il semble que de nombreux arrangements coexistent, convergent, se recouvrent ou s’écartent, loin de pouvoir se lire selon un modèle dual opposant moderne à traditionnel, urbain à rural ou métropole à petite ville. L’étude de la distribution actuelle des agglomérations et celle émergente à l’horizon 2011 questionnent la pertinence de la division et de l’opposition récurrente entre urbain et rural. 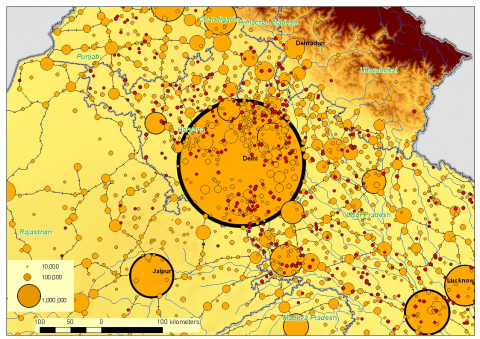 Settlement distribution in India, dispersion and/or concentration? 1With increasing attention being paid to India’s economy after the impressive global surge of the country’s top industrial corporations, a new perspective has emerged on the urbanization in the subcontinent. It now focuses on the metropolitanization process associated with the opening up of the economy and the concomitant high economic growth. 1 See Moriconi-Ebrard, Denis, and Marius-Gnanou, 2010. 3 €14.7 billion at the average exchange rate during December 2009. A crore is equal to 10,000,000. 3India’s urban policies during the last 15 years have supported polarized growth. Metropolitan concentration and neo-liberal restructuring have gone ahead hand-in-hand, the former at times even leading economic liberalization. The current spending of the Jawaharlal Nehru National Urban Renewal Mission (JNNURM), launched in December 2005 with a Rs100,000-crore3 fund, targets 65 strategic urban centers with strong economic growth potential. They include 35 metro cities and mega-cities plus other cities of under one million inhabitants which are either state capitals or cities of particular cultural, historical or touristic importance, such as Pondicherry, Ujjain and Shillong. Its stated objective is “to create economically productive, efficient, equitable and responsive cities”4, which appears well aligned with national economic strategies such as promotion of public–private partnerships in infrastructure development and the government’s Special Economic Zone (SEZ) policy.5 Half of the amount has been earmarked for use for essential infrastructure projects by the end of 2010 (Sivaramakrishnan, 2009). In this context, the role of the State Governments in urban affairs remains central, as demonstrated by efforts to promote their own capital cities as major investment centers using JNNURM resources, while quite often ignoring local urban authorities (Sivaramakrishnan, 2009). Indeed, the effects of those policies are likely to be evident in the metropolitan cities of India; Mumbai exhibits these to a considerable extent along with Delhi (S. Banerjee-Guha, 2009). 4However, this approach has led to a neglect of the secondary cities and small cities, which together represent a significant share of India’s present urban dynamics. 6Seen thus, the Geopolis definition eliminates the technical or methodological biases of the official definition, linked in the case of India to the problem of the spread of an agglomeration over different administrative units either officially rural or urban and/or crossing State borders. As far back as 1987, Ramachandran proposed the concept of “geographical city” to avoid biases introduced by the Census: “It [the geographical city] includes all contiguously built-up areas around a main settlement; irrespective of the administrative status of these areas… its limits can be accurately determined with the help of an aerial photograph of the city. However, such aerial photographs are not always available, so the geographical city is essentially an idealized, abstract concept” (p. 110). 7Having carried out the necessary processes of standardization on a diachronic set of data, verification on the ground and digitalization of each morphological configuration, we can now offer a scientifically valid view of India’s urban continuum. These steps have eliminated most (if not all) of the distortions resulting from an unquestioning dependence on official figures. Besides attempting a classical analysis of demographic trends, we also consider in this paper the country’s urban forms and, indeed, the complete settlement system. 8In examining the processes of physical and socio-demographic agglomeration, we impose no prior assumptions or models regarding economic, political, or administrative influences on the setting. The socio-geographic transformation that we uncover as we consider the physical and geometrical dimensions of agglomerates, and the trends in their distribution, concentration, diffusion, and redistribution that will become discernible, enable an analysis of the factors of the agglomeration process. It then becomes possible to take a closer look at the hypothesis of the New Economic Geography, which sees the polarization of the population as correlated to the economy and the financial conditions in the major metropolitan regions. 9Indeed, India has been experiencing a high level of GDP growth but with a moderate trend in demographic polarization by the major cities. Clearly, the two processes could hardly be said to overlap to any significant degree. The diffused demographic urban system that characterizes India, in fact, does not seem to have affected the country’s strong economic growth, with GDP advancing at an annual average of 7.2% from 2000 to 2008 at constant prices. In 2009, its economic resilience and its ability to avoid most of the effects of the global financial crisis, especially in terms of industrial production, provided a clear proof of the trend, its GDP registering a 6.9% growth rate for the year. The parliamentary elections of May 2009 served to confirm the emergence of the ordinary provincial settlement as a focus of an urban setting with a clear political consciousness: the provincial electorate or the mofussil society distanced itself from both the Hindu nationalist and the Communist parties and their agendas, proving that a rural India for which those agendas might have held an appeal only existed in the minds of politicians. 10Let us first highlight the problems connected with the irregular uses of the official urban definition from States to States and other discrepancies. Then, we display the difference between the landscape of morphological agglomerates observed and the official set of urban Local Bodies regarding the primacy and metropolitanization before reviewing the emergence of secondary and small agglomerates. An extended urban landscape is revealed, and its consequences are analyzed. 11As officially recorded, urban demographic growth in India was very significant during the past century. The urban population doubled from 1901 to 1947 (Independence of India) and grew at least six-fold during the period from 1951 to 2001. 12However, the rate of urbanization, as defined by the Census of India, remains one of the lowest in the world (28% for 2001), while the natural growth rate for the country remains relatively high (+1.6% / year). It is therefore generally agreed that India is presents the highest potential of urban growth among world economies. Paradoxically, India’s rate of urbanization appears even lower than that of Western Africa, which was 30% in 2000 (Denis and Moriconi-Ebrard, 2009). 13This single relative figure does not reflect urban reality and regional heterogeneity: the urban population in several states like Tamil Nadu (43.9%), Maharashtra (42.4%), and Gujarat (37.5%) was well above the national average for 2001. Even at less than 28%, according to the 2001 Census results, India’s urban population officially amounted to 285 million inhabitants, the equivalent of almost the entire population of the United States of America. One out of every 10 urban citizens of the world is Indian. India has 35 cities of one million-plus inhabitants with a total of 108 million inhabitants accounting for 38% of the country’s official urban population. One of the most talked-about aspects of this growth is the emergence of three agglomerations (Delhi, Mumbai, and Kolkata) with populations exceeding 17 million inhabitants each in 2009, thus belonging to the class of the world’s “mega-cities” as defined by the United Nations/ESA (World Urbanization Prospects). 14However, the process of urbanization extends well beyond these mega-cities and the so-called metrocities in India (cities having more than one million inhabitants), spilling over into vaguely defined small- and medium-sized localities. It is this category, hovering between the urban and the rural, that eludes the statistician’s eye and therefore presents difficulties for a proper demographic profiling of the country. 15Without denying the importance of metrocities in India’s booming economy, one must in fairness take account of the spectacular growth of small- and medium-sized agglomerates. Their classification as either rural or urban is a critical issue vis-à-vis harmonious or inclusive development and spatial redistribution of wealth. 16The existence of the category was first noticed in the 1980s. P. Rao (1983) pointed to the state of the country’s “rural-urban continuum”, calling the topic a key question of that decade. The subject has suffered neglect in recent times, as urban development research and planning have tended to conform to mainstream thinking on economic liberalization with metro cities as its motors. 17In 2001, for the first time in India, official statistics (see Tab. 1) showed that the number of “villages” with more than 10,000 inhabitants exceeded the number of “towns” and “urban areas” with comparable populations. If these “villages” were added to the urban category, then India’s proportion of that category in its total population would rise significantly. Thus, one may legitimately ask: Are these “villages” rural or urban in reality? 18In the interest of scientific propriety, one may question not only the methods used in the official measurement of the urban growth in the country, but also the representation of the phenomenon, given that they failed to take into account the existence of several thousand small-sized agglomerates meeting the specified demographic criteria of the urban category. One suspects that statistical and political considerations have led to an omission of thousands of small agglomerations of between 10,000 and 30,000 inhabitants. 19The problem is exacerbated by another anomaly: while Gandhi viewed the village as the soul of India, there is the transnational, cosmopolitan and neo-liberal view of the metrocity as a uniquely effective motor of all-round national development, a view favored by India’s private and dominant public actors. 20In fact, the vision of village development as the objective of the PURA8 program (Providing Urban Amenities in Rural Areas), launched in 2004 in several states, has already been overtaken by the reality of population and settlement dynamics. The aim of the program, which was proposed by former President A. P. J. Abdul Kalam, is to enhance village facilities in order to reduce migration of villagers to urban areas for employment, education, healthcare, etc. 21Aiming to do away with the confusion surrounding the meaning of the term “town”, the Census of India (The Registrar General & Census Commissioner, 2001) in 2001 revived two definitions, one from 1951 and the other from 1961, though with some slight modifications (Verma, 2006). A statutory town was defined as one which possessed one of the following: a municipality, a municipal corporation, a cantonment board, or a notified town area committee. That State law could determine the status of such a town meant, in effect, that often contradictory political pulls could play a role in the decision. A Census town had to meet the following minimum criteria: (a) a population of 5,000, (b) 75% of the males in the working population engaged in non-agricultural activities, and (c) a population density of 400/km2. 22The regional list of statutory towns depends on administrative decision. Indeed, the 2001 Census showed 191 local units with fewer than 5,000 inhabitants designated as urban, sometimes with only a few hundred. In contrast, Census towns only depend on statistical criteria. The declared Census towns are not necessarily becoming towns in terms of services and programs provided as for tax status for its inhabitants and activities. They stay mainly under the Rural Development and Panchayat Raj administration. 23How one chose to define a Census town—either in very liberal terms of the phrase at one extreme or a very restrictive interpretation at the other—depended upon the State in which one was located, the Census period, and, of course, one’s political affiliation. The population density element added to the general variability characterizing the entire approach. The local area chosen for this parameter rarely corresponded to the built-up extension, which it often overestimated. There was also the incontrovertible fact of wide variations in population density prevailing among regions even within a single State, thus making it difficult to apply a common density referential across the board. 24A further complication arose when the directors of the Census operations were authorized in 1991 to designate some areas as urban even if those areas only possessed some of the distinct urban characteristics9. That such a step was to be taken in consultation with the concerned officers in the state governments, the union territories and the Census Commissioner of India did little to mitigate the arbitrary nature of the measure10. 25Sivaramakrishnan et al. (2005, p. 31) provides a more recent appraisal of the situation: “There are about 3,000 villages having a population above 10,000 in the country and their inclusion within the urban fold would immediately increase the percentage of the urban population by five percentage points. It may nevertheless be pointed out that, for acquiring urban status, it is necessary for a settlement to have 75% of the male workers involved in the non-agricultural activities. Unfortunately, the share of non-agricultural employment in these 3,000 large villages is less than 40% in 1991.” The set of urban units as shown by the Census appeared to be affected by many discrepancies in the regional applications of the application. 26Our own provisional results confirm the underestimation of the small agglomerations in the current state of our knowledge: many of the 3,986 “villages” of more than 10,000 inhabitants in fact correspond to dense and continuous built-up extensions Census town notification is not linked with a change in administrative status; Census towns stay under the rural panchayat administration and do not beneficiate any urban schemes. We have to consider this fundamental point when we assess the urban dynamic. 27Also widely used for political, administrative and census purposes, the Urban Agglomeration (UA) notion introduces many instabilities and distortions in the common vision of India’s urban distribution and its growth11. The 382 Urban Agglomerations of 2001 followed the definition given by the census administration12. 28One of the main problems with urban agglomeration as presently interpreted is that it should be defined only within political and administrative boundaries, that is, by the State. In this scenario, the real urban sprawl of agglomerates, such as Delhi’s toward Haryana or Uttar Pradesh, gets totally neglected. Another example is Pondicherry, which extends unnoticed into Tamil Nadu, the surrounding State. Beside this constraint, many core cities that morphologically extend beyond their administrative boundaries and encapsulating villages could not be extended in UAs or enlarge their existing UA with OG. The procedure is very long and politically debated and negotiated. So, again, a deformed view of the urban setting becomes obvious, leading to a wide under-estimation of the “real” morphological process of agglomeration. Furthermore, the UA category does not incorporate the contiguous spreading of urban agglomerates adequately and on time: between 1991 and 2001, only one solitary UA was promoted; there were 105 between 1981 and 1991. 29As presently understood, the UA concept leads to a highly distorted view of the reality of urbanization in India. 30In the context of an intense urban expansion, an application of the definitions enables the inclusion of new localities in the urban category at each Census; however, it is hard to understand the exclusion of hundreds of cities returning to the category of “villages” and therefore disappearing from the current “urban” statistics. 31The increase in the number of “cities” between two consecutive Censuses, and more generally the rate of urban growth, together reflect the difference between rural agglomerations that become urban (“incoming”) and urban agglomerations that revert to their rural status (“outgoing”). The small towns and those at the fringe of an urban agglomeration form a continuum with unstable thresholds at the lower end of the urban hierarchy and are clearly manipulated for political and administrative expediency. 32At the national level, the population figures for newly promoted towns minus those for the declassified towns indicate a general trend toward reduced upgrading of villages to town status, apart from a demographic and morphological trend clearly in favor of agglomerations: they represent 13.8% of the demographic urban growth during 1961-1971, 14.8% during 1971-1981, 9.4% during 1981-1991, and only 6.2% during 1991-2001. * Town and village panchayats are the smallest local administrative bodies within which census results are given. 33Between 1991 and 2001, 445 towns were declassified, while 1,138 were promoted including 636 within UAs (compared to 93 declassified and 856 promoted between 1981 and 1991.) In Andhra Pradesh alone, declassification of 79 agglomerations accounted for a decrease of 7% in the urban population, and the inclusion of 35 (within UAs only) increased the urban population by 2%. The apparent stagnancy of the urbanization rate in Andhra Pradesh between 1991 and 2001 (from 26.8% to 27.1%, when the regional demographic annual rate of growth was 1.15% for the same decade) is largely the result of the missteps detailed above. In contrast, in Tamil Nadu, 456 new towns were created, while 61 were declassified—about 40% of the urban promotion all over India in that State only accounting for 6% of the Indian population. These urban promotions account for 21% of the regional urban population in 2001. Many similar anomalies could be cited. 34The foregoing analysis exposes the regional distortions and flawed diachronic approaches that affect a reading of the urbanization scene in India. Schaffar’s claim (2010, p. 109) that data from the official Census figures, based on apparently harmonized official definitions, could be used to obtain reliable statistical series becomes as untenable as P. Datta’s (2006) naïve and unquestioning acceptance of the official urban/rural divide. 35Under the dynamics of decentralization, especially after the progressive regional implementation since 1994 of the 73rd and 74th Amendments13, State decisions have been seen to misrepresent the urban setting, driven by political considerations and local questions of development. Our colleague Amitabh Kundu (JNU, Delhi), like many other economists involved in urban analysis and in studies of labor and production statistics, underlined “that the different states in India are not amenable to comparison amongst themselves”. All analyses trying to explain inter-state differences in terms of urbanization usually commit a political and statistical fallacy. For instance, the level of urbanization appears low, at 26%, in Kerala where 1,072 settlements, each with a population of more than 10,000 inhabitants together representing 21.7 million inhabitants, are registered as villages (Tab. 1). Chaurasia believes that this is “because of the reluctance of the state government to grant municipal status to large villages” (2007, 150). Certainly the same could be said about West Bengal, but more precise analysis based on fieldwork is required to understand the local, regional and national politics of promoting towns. We are not yet able to give a clear explanation for these regional distortions of the urban category. 36It is clear that reliance on official urban growth rates or official urban categories can lead to severely flawed statistical constructions, not valid physical distributions. 37The official Indian definition of “urban” introduces a high degree of variability in the contours of the urban system, especially at the bottom of the urban hierarchy. It is therefore rightly criticized by many scholars (Sivaramakrishnan et al., 2005, p. 19; Ramachandran, 1987). Official Indian statistics classify cities into six categories: Class I groups together cities with at least 100,000 inhabitants; Class II, towns with more than 50,000 inhabitants; Class III, towns with more than 20,000 inhabitants; Class IV, towns with more than 10,000 inhabitants; Class V towns with more than 5,000 inhabitants; and Class VI, towns with fewer than 5,000 inhabitants. Table 3 shows an additional category of “metro cities” with one million or more inhabitants. 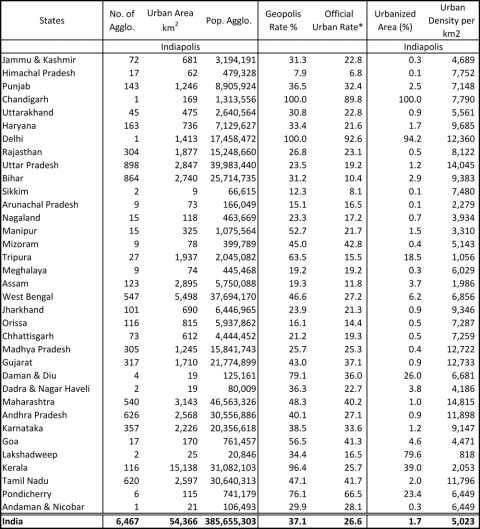 38Retaining only 3,279 settlements as urban with at least 10,000 inhabitants each —389 in Class I (35 with more than 1 million inhabitants), 399 in Class II, 1,154 in Class III and 1,337 in Class IV—, the official Indian urban data set presents a very “Malthusian” vision. 39In the 1891 Census, Class I included 23 cities for an overall national population of about 250 million inhabitants;14 in 2001, it had 389 Cities. This type of representation in a system of classes with demographically fixed thresholds in an expanding world leads to the image of an urban explosion, which is primarily that of statistical categories: from Census to Census, few new settlements are brought into the urban category, and those presently existing automatically move toward Class I, which now includes many secondary cities with well over 100,000 inhabitants. The increasing dominance of the Class I cities results from an automatic graduation of lower-order towns into the Class I category. 40In fact, in absolute terms, even Class I becomes much more important with Indiapolis, numbering 451 units versus 389 official units (Table 3). Indiapolis adds two agglomerations, each with more than one million inhabitants, and 60 supplementary agglomerates of between 100,000 and 1,000,000 inhabitants each. In total, some 49 million inhabitants have been added to Class I, of which 38 million are living in contiguous units on the fringes of the official Class I units. Following the Geopolis definition, some 4,790 towns and villages have been incorporated in Class I cities as they fall in the category of contiguous built-up structures. 41In the Indiapolis approach, the distribution appears less truncated, given 37.5% as the global rate of urbanization for 2001 and considering all the physical agglomerates of at least 10,000 inhabitants. Compared to the official rate16 of 27.1%, this is 10.4% higher in terms of the population but almost double in terms of the number of settlements with at least 10,000 inhabitants considered. 42Officially, there were 888 towns of between 5,000 to 10,000 inhabitants in 2001, whereas the Indiapolis program observed 11,917 continuous built-up footprints in this range. These towns added some 79 million inhabitants to the urban population, while the official Class V counts only 6.6 million. Globally, of the 464 million persons or 45% of the Indian citizens living in agglomerates with at least 5,000 inhabitants each in 2001, 176 million or 38% live in administrative units with a rural status. 43If the trend of the aggregate populations of cities of over 100,000, as provided by the Geopolis/Indiapolis geodatabase and those as officially supplied, is near-equivalence the small-city layer of under 20,000 (the official Class IV: 10,000 to 20,000) is growing fast. 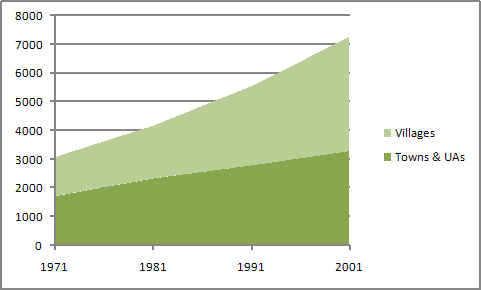 Its share more than doubled from 19 million to 50 million inhabitants between 1991 and 2001. 44While the urban population of Class IV officially declined from 13.6% in 1951 to 6.9% in 2001, it is paradoxical that Class III had its maximum share in 1961 and Class II in 1981. The Geopolis/Indiapolis database also shows an expanded Class I in absolute terms, with the addition of 62 new agglomerates and 49 million urban inhabitants. These invisible citizens of the outskirts of large cities clearly lived and worked since Independence to 2001 outside the purview of an Urban Local Body. They depended, for all practical purposes, on a rural local government of sorts for their needs. 45The use of the Geopolis definition makes possible an assessment of the agglomeration system and its trend much more uniformly at the scale of the sub-continent. Bottom-level urbanization is unveiled, and the regional and local political/administrative bias is avoided. A uniform use of the “contiguous built-up area” concept across the subcontinent unveils the spread of small agglomerates of below 50,000 inhabitants but also reveals the broad extent of the sub-metropolitan world that is not included in the official urban agglomerate category (UA) numbering 382 units in 2001. 46The problem that one encounters in studying the urbanization in India today is as much the expansion of small cities as the representation of the phenomenon itself. Yet, it is precisely in this category of localities that we presently observe the most significant changes, which lead to questions of enlarged regional metropolitanization, corridor development, and urban villages (McGee, 1992; Denis, 2006). Are we witnessing a dynamic of polarization in India or a more dispersed trend? Are the small localities going to be incorporated into extended metropolises polarizing the economic growth potential or developing a more diffused urban landscape? 47Following the examples of large countries like China and Brazil, the Indian urban system is not affected by an extreme primacy trend. The Indian’s size and the colonial legacy of the past mitigated by the rule of princely states have been some of the major causes disallowing urban primacy. The subcontinent did not become a politically unified nation until 1947 (Verma, 2006, p. 194). 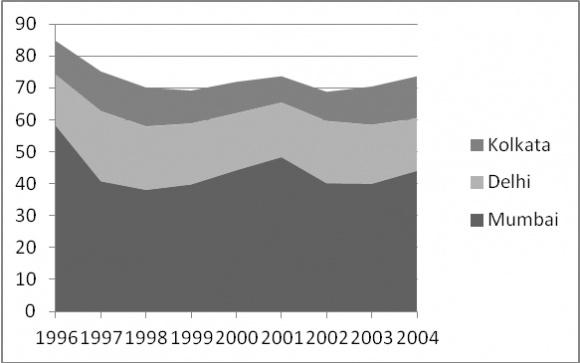 However, over the course of the past half-century, the country’s urban system and regional urban dynamics have changed. Mumbai, Delhi, and Kolkata, each a mega-city of well over 10 million inhabitants, and Chennai, with almost 8 million, have led the transformation. 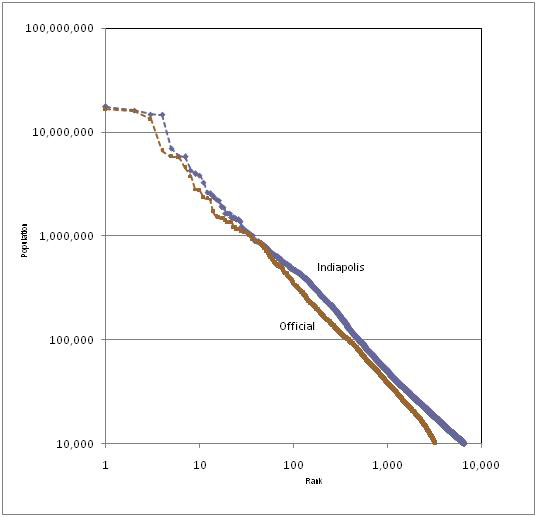 48While the absolute value of the slope of the rank-size curve for very large urban systems, such as those of the USA or Europe, is almost equal to 1.00, it is 1.02 for the official urban areas of over 10,000 inhabitants and 1.05 for the Geopolis/Indiapolis data (Fig. 2). The maturity of the urban system does not seem to be the only way to explain its conformity to Zipf’s Law. An assemblage of multiple systems also introduces a kind of apparent harmonization, as in the case of Europe. India’s long history of multiple and sometimes contradictory public interventions as well as divergent economic and social actions (cf. Chakravorty and Lall, 2007) have certainly contributed to dilute a balanced growth and reduced the prospects of a clear and unique primacy . Today, these contradictory policies appear in the form of “support India Inc.” versus inclusive growth policies, or the JNNURM program versus the National Rural Employment Guarantee Act (NREGA)17. 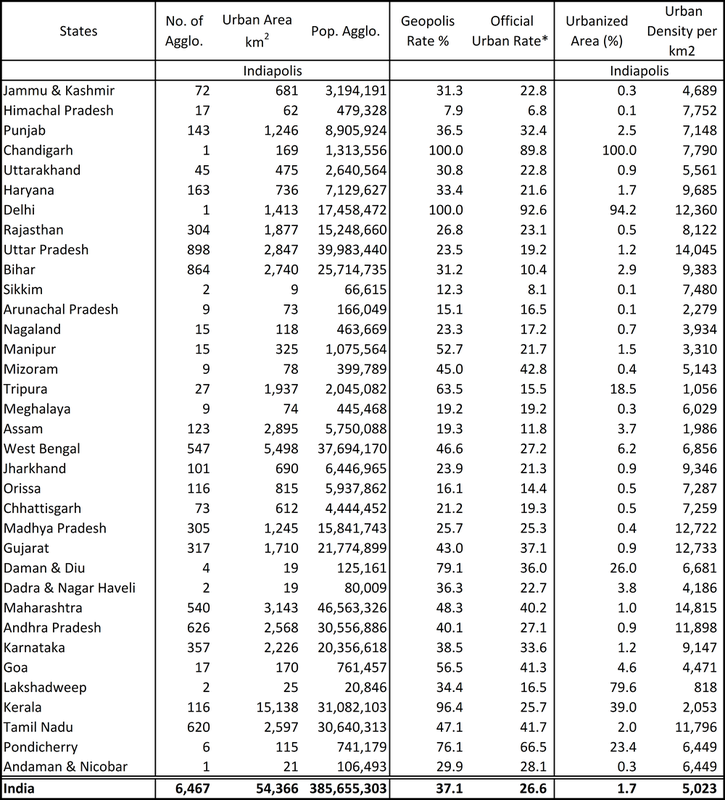 49The various indicators of a fast-growing regional capital suggest a State-wise centralization in India. In this era of decentralization and economic liberalization, the role of the hierarchy of public institutions vis-à-vis the hierarchy of the urban network invites particular attention and comment. In this context, the assertiveness of the States, starting from 1956, has given rise to a climate favorable to the ushering in of the “primate city” concept. The regional hierarchies are understandably perturbed by the involvement of certain major cities in the economic dynamics of the country. 50Bangalore/Bengaluru’s dominance is strengthened by its leading position in the IT sector, as is Chennai’s with its automotive, IT, and BPO industries. The economic rise of Pune, notably with the presence of the Tata group and the IT sector, has weakened the regional primacy of Mumbai. Visakhapatnam (1.4 million inhabitants), an industrial hub supported by a major harbor and boosted by the strong public investment by the Indian Navy since 2000, can now compete with Hyderabad18. Siliguri, in West Bengal, is also a fast-growing industrial city capable of reducing Kolkata’s primacy in the State as well as the physical expansion of the Kolkata metropolis. Nevertheless, Kolkata is way ahead of the other agglomerates of West Bengal: its rate of primacy was 24.9 in 2001 and 189 of the largest agglomerates would be needed to equal its population. In Maharashtra, it would take the total population of just 14 of the largest agglomerates in the State to equal that of Mumbai. * The ratio of the capital’s population to the second agglomeration’s population. 51The image of an urban explosion in the mega-cities belongs to the realm of statistics. The eight largest metropolitan cities of India, with projected populations of over 6 million in 2011, excepting Delhi, experienced a decline in their growth rates from 1991 to 2001 compared to the preceding decade (table 5). 52When it was still the capital of the Moghul Empire in 1872, Delhi was no more than a modest city of 162,000 inhabitants. In 1951, the agglomeration in Delhi was half as populated as Bombay (Mumbai) and one third as much as Calcutta. Delhi started expanding rapidly only after Independence to become the most populous city of India in 2001. 53This measure, assessed on the ground, contradicts the last UN projection (2007) that Mumbai, with an expected population of 26 million in 2015, would become the world’s second largest agglomeration. In fact, the ratio of Mumbai’s population to the country’s total urban population declined from 8% in 1961 to 5.7% in 2001 (see Tab. 6). Mumbai, in demographic terms, is not growing much faster than Kolkata in spite of its high economic growth, the opening up of the economy to FDIs, and the city’s financial centrality. 54The slight rise in the growth rate of Delhi’s population is a result of the statistical definition provided by the Census of India, which, by minimizing the size of the real population of Delhi’s agglomerations, biases the appraisal. The major hurdle to Mumbai spreading is its highly constrained geographical area. Its 472 km2 area makes Mumbai the densest mega-city in the world, with 31,138 inhabitants/km2, three times as dense as Delhi, with its 1,413 km2 area. In fact, Mumbai only covers an area equal to Chennai with more than twice its population. 55Outside of industrialized countries, Kolkata became the world’s first agglomeration to have more than one million inhabitants in 1872. In 1991, it was overtaken by Mumbai, which started to become a financial hub; today, Delhi’s agglomeration takes the top spot. 56Kolkata is again ahead of Mumbai in demographic terms: its built-up area has extended greatly, encompassing the surrounding towns and villages, a feat that has not been possible for the capital of Maharashtra. The mitigating trend of Mumbai trying to correspond to the archetype of the Indian Global City, after the famous McKinsey report “Vision Mumbai”, has been described by Appadurai (2002) and Varma (2004) as being caught up in the “provincializing”, “denationalization” and “decosmopolitanization” processes after the riots of the closing months of 1992. 57As Table 6 shows, Chennai, Hyderabad, Bangalore/Bengaluru, and Ahmadabad either show attrition in their shares or stagnancy since the 1980s. 58Taking into account the 35 official metro cities of 2001 (table 7), one might make the following observation: these cities have held 35% of the country’s urban population in 1941; that share remained stable at around 39% between 1961 and 2001. However, as a percentage of the total population of India for comparable periods, their population showed significant variations, rising from 0.4% to almost 11.0%—pointing to a strong process of metropolitan concentration at work during the preceding half-century. In fact, we estimate that the number of agglomerates of over one million will reach 60 in 2011 and will accommodate 18% of India’s population. It is our expectation that the process of metropolitanization will extend further and cover more cities. 59Demographic magnetism continued to be felt along with polarization resulting from high economic growth in the metropolitan regions. Delhi had to find room for 530,000 migrants per year between 1991 and 2001, while Mumbai had to cope with 516,000 new arrivals per year. Such trends imposed pressures on transport services and housing, among other facilities. The negative impacts of economic concentration on the entire social system clearly outweigh its apparent benefits. A corollary of a decline in the rate of natural growth is the significant growth that migrations contribute to major metropolitan agglomerates. Migrations accounted for 75% of new agglomerations in Delhi, where the rate of natural growth fell from 1.4% to 1.3%. For Mumbai, it was 65% of new agglomerations vis-à-vis the fall in the rate of natural growth from 1.5% to 1.2%. 60Amid the restructuring in the metro cities, particularly in those located in the more dynamic States, recent political happenings in West Bengal might well lead to a quicker economic repolarization within the Kolkata metropolitan area. Together with the accelerating changes in urban governance since the late 1990s, this movement toward increasing private development has been driven by the need for modernization experienced by the growing cities themselves as the country enters its second decade of steadily high economic growth. It appears sensible to expect that, having gone along with the Center’s macro-economic policy and having accepted its neo-liberal dogma and India’s positioning in the global markets, these forces would be able to sustain and nourish this growth machine (Shaw, 2006; Banerjee-Guha, 2009). However, the agglomeration process extends well beyond the major million cities and metro cities and increasingly to secondary and smaller cities, not to mention village agglomerates. The questions that arise in this context concern the aspect of spatial structuring of this extended urban world, specifically, how metropolitan regions are expanding and where and how corridors are coming into being. 61This “peripheralization” and satellite reorientation of economic development has been encouraged by state policy and local government support through simplified building laws and zonal regulations, as well as through incentives. One of the main drivers of the cluster approach with the purpose of better polarized economic growth has been the SEZ Act of 2005, which has given a powerful impetus to investment. Metropolitan areas are now spreading outwards to meet the rising demand for housing, office space, schools, hospitals, and other services (Shaw, 2005). This has resulted in the merger of smaller towns or their inclusion in the larger urban agglomerations. More and more villages are being encroached upon through this process. 62Our own calculations, based on the per capita GDP as provided by the Regional Human Development Report Series, confirm the metropolitan concentration in terms of the Gross Urban Product (GUP). The seven major metropolises’ agglomerates with more than 5 million inhabitants each (Delhi, Mumbai, Kolkata, Chennai, Bangalore/Bengaluru, Hyderabad, and Ahmadabad) accounted for 19.6% of India’s GDP in 2008 and 14.4% in 2001. 63Some 73.6% of the stock exchange capital turnover in 2004 is concentrated in the three major financial and demographic cities of India: Mumbai, Delhi and Kolkata (figure 3). While their respective share had been more or less stable from the end of the 1990s until 2004, Chennai’s share declined steadily from 4.6% to 2.8% during the same period, as did that of Pune (from 2.2% to 0.9%) and Coimbatore, the city of the textile and mechanical industries (from 3.4% to 0.4%). A financial concentration has clearly been at work alongside industrial redistribution through the expanding network of metropolises and secondary cities. 64The extent of global influences and metropolitan polarization can also be seen through the concentration of FDIs within the metropolitan areas. In an earlier study, Shaw (1999) detailed the size and type of both global and domestic investments that the major urban regions of the country had attracted during the 1991 to 1998 period. The trend toward metropolitan polarization that the study revealed has since been confirmed by Chakravorty (2007). The largest cities have captured most of the FDI funds as domestic investment. In 2008 alone, 58% of the foreign companies registered in India were located in the Delhi–Gurgaon region, 21% in Mumbai–Pune, 9% in Bangalore, and 5% in Chennai, accounting for 93% of the total (Source: Lok Sabha Unstarred Question No. 4742, dated 25.04.2008). During the fiscal year 2006-2007, Delhi–Gurgaon was the location favored by 26.4% of new companies in India, representing 36.6% of authorized capital (Source: Ministry of Corporate Affairs, Govt. of India). Mumbai appears second with 27.2% in terms of capital20. While 11,000 firms were set up in the State of Maharashtra (including Mumbai and Pune) between April 2009 and January 2010, there were 44,000 in the National Capital Region (Source: Ministry of Finance, Government of India). The growing dispersal of micro-agglomerates is associated with alternative local dynamics at the edge of an urban-rural linkage at a level that remains to be assessed in regard to diffusion and potential percolation from metropolitan growth. 66These potential trends will have to be more precisely assessed and explained in a near future using complementary economic information, notably GDP and financial data by district, and plant locations. 67According to official sources, the extension of urban areas by means of the process of adding towns around core UAs accounts for 9.7% of the total urban population; specifically, 1,162 towns were included in the existing UAs in 2001. In fact, due to loss of urban status of peripheral units, that number was 140 less than in 1991. In other words, urban geographical extension appears officially to be shrinking. Of course, demographic growth is consequently reduced. There were fewer UAs in 2001 than in 1991, partly due to the UAs’ fusion, but in most of the cases because of loss of urban status. Those adjustments again reduce the region-wise comparability of urban data: for example, in West Bengal 17 UAs have been declassified, while in Andhra Pradesh, 22 have been promoted. 68From the Indiapolis Geodatabase, it appears that 2,685 contiguous built-up areas with at least 10,000 inhabitants each were composed of more than one unit (Tab. 8). In other words, 41% of the agglomerates observed encroached on at least one adjacent administrative unit. Those multi-unit agglomerates accommodated 77.2% of the urban population. Urban local bodies incorporated in multi-unit built-up areas experienced on average an accelerated demographic annual growth rate between 1991 and 2001 of 3.5% or 1% more than peripheral rural local units where 11% of the agglomerate populations reside. Those 42 million citizens were living on fully adjacent outskirts of cities without enjoying any of the benefits of their agglomerate status guaranteed under the 74th Amendment. They depend of the rural administration, tax, services and schemes. Another 18 million settled in 1,468 multi-villages agglomerates with no affiliation to an urban local body. More than 80 of those units had over 50,000 inhabitants each in 2001. There were also almost 27 million Indians living in unique rural localities with at least 10,000 inhabitants in contiguous built-up areas. Thus, in 2001, there were more than 87 million Indian citizens generating and experiencing agglomeration conditions of life without receiving any particular attention (Map. 6). 69The agglomerated population living in contiguous built-up areas of at least 10,000 inhabitants in 2001 encroached on 1.6% of the territory of the Indian Union. It is in this tiny patch of land that most of the private and sizable public funds are invested. Nevertheless, the 54,366 km2 that this figure represents is more than double the area which the Indian Ministry of Agriculture has notified as land for non-agricultural use (excluding forests and barren lands). This shows yet another bias in the estimation of the agglomerate world in India (Indiastat.com, 2009). Urban encroachment is officially underestimated. The area of 185,500 km2 under permanent cultivation accounts for 5.6% of the total area of the country. Its functional proximity with the urban system put this vital space at risk vis-à-vis housing, infrastructure and industrial encroachments that are occurring mostly in peripheral villages where urban legislation to control the land use is not in place. 70According to the Geopolis approach, the agglomeration of Thiruvananthapuram (previously Trivandrum), the capital of Kerala State (Map 7), has a contiguous built-up area of 9,040 km2 (six times the built-up area of Delhi), and accommodates 16.7 million inhabitants. With an average of 1,850 inhabitants per sq. km, this extremely large unit still has a higher density than most of the metropolises of North America and three times the density of the agglomerate of Brussels. In this strategically important city, the military sector sustains and supports the surrounding IT sector. 71The Desakota model, well-known elsewhere in Asia, can be applied in Kerala as an urban/rural continuum as identified by Chattopadhyay (1988) and analyzed as such by Casinader R. (1992) and Pauchet and Oliveau (2008). In Kerala, the inclusion of the contiguous built-up villages within the urban agglomerations has the effect of substantially increasing the agglomerate area: one-third of the State appears completely agglomerated with less than 200 meters between constructions. 72Kerala is an interesting issue in terms of governance and planning if we consider the fact that it is no longer a rural state by all major indicators (availability of good infrastructure facilities, a well-educated workforce and post-reform laws—all of which have attracted a large number of private firms). The share of the service sector in the Regional Gross Product was 64% in 2006, and IT is becoming the major driver of growth (Amir Ullah Khan and Harsh Vivek, 2007). In contrast, the share of the agriculture sector was some 17%. This extended built-up continuum is consolidated by the economic strategy of the large numbers of workers living abroad, notably in the Gulf monarchies, who invest their remittances first in land and real estate. 73Among all these aspects that characterize the extreme diversity of forms of Indian urbanization, the most remarkable is the recent proliferation of small agglomerations. Besides (or accompanying) the concentration of population and activities within the million plus cities and the formation of urban mega regions, the process of urbanization in India seems more and more oriented toward small and medium agglomerations that are mostly left out of the urban administrative reckoning. The million-plus cities were the fastest growing class at 3.1% of annual growth rate between 1991 and 2001. Agglomerates below 20,000 were growing at only 2.8%; however, during the 2001-2011 decade, their rate could reach over 4% if we consider the stability of the residential migration pattern, a trend which has already been confirmed by several national surveys. Small towns will have grown at a comparable rhythm to million-plus cities, notably through the emergence of new units crossing over 10,000 inhabitants. 74The development of the Indiapolis dataset helps in an examination of the genesis of the situation in 2001 with 49 million Indian citizens living in agglomerates of between 10,000 and 20,000 inhabitants—almost 13% of the country’s total urban population distributed across 3,616 agglomerates. * Projection method: see footnote 16. 75The Geopolis method has opened the way to a morphologically determined projection of the agglomeration landscape for 2011. Using satellite imagery,21 the technique has enabled the observation and geolocalization of 11,913 agglomerates of between 5,000 and 10,000 inhabitants each. Together with a projection method based on the observed decrease in the natural growth by region and constant migration, this method yields a figure of 1,977 new settlements of at least 10,000 inhabitants each for 2011. The 26.7 million inhabitants of these agglomerates would have contributed to some 15.6% of the absolute growth in population between 2001 and 2011 (Tab. 10). 76The emergence of small agglomerates such as these is changing the urban setting in respect to rural access to services. Goods and service facilities are coming nearer to the consumer, and services of new kinds are emerging, inducing a diversification of jobs, notably in construction, food supply and processing, and groceries. They extend to the more advanced areas of telecommunications, the Internet, and transportation. Improved transport facilities have led to daily commuting for seasonal or casual employment in preference to non-residential migration. 77One will need to further analyze this structural trend, which has only been identified via a limited number of field studies. For this purpose, one will require a systematically organized set of data with a bearing on the distribution of services, local public funding, and related activities. The trend holds potential for India’s particular strengths, such as cheap labor, low land prices, tax holidays, and flexibility of employment through non-formal linkages with the concerned sectors—all great assets in the global market place. Dispersion rather than urban agglomeration should lead to reduced costs. This is particularly the case in sectors in which India is leading, such as Business Process Outsourcing, and equally in the textile industry and food processing, driven by local demand and rising consumption and boosted by simplified access to finance. The high economic growth of India is much more driven by low cost than innovation. 78Three spatial combinations can be discerned in this context: (i) continuing polarization inducing the enlargement of the metropolitan area by incorporation of urbanized villages and small towns tending toward some emerging Desakota regions; (ii) axial interconnections supported by corridor infrastructure projects that will generate linear development merging rural and urban environments; and (iii) disseminated/centrifugal trends of work-intensive activities helping to generate some sort of dispersed city landscape, or città diffusa or agropolitana (Ferrario, 2009). 79In the context of the relatively moderate and stable flows in residential migration in India for the past 20 years, the distribution of settlements and the progression toward concentration point to the future form of urbanization in the country. 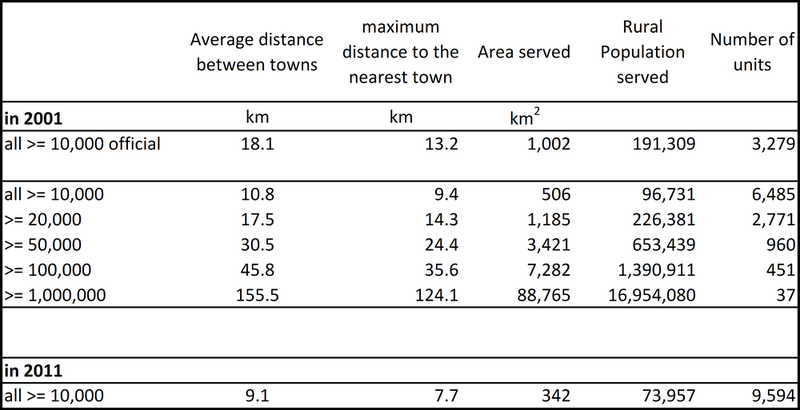 Distance to the nearest town is an easily understood and meaningful measure of urbanization (Ramachandran, 1987, p. 126). 80For 2001, the Indiapolis Urban System, with its 6,467 units, gives a mean distance of 10.1 km between agglomerates with at least 10,000 inhabitants each, whereas the mean distance between official cities is 18.1 km (the distance falls to an average of 6 km with all the 5,000). In 2011, the distance among 10,000 agglomerates is projected to be less than 10 km. The mean distance between towns with at least 20,000 inhabitants was 13.3 km in 2001, down from 56 km in 1981. In other words, the agglomerate landscape has shrunk significantly. 81Specialized services that are only available in large towns with over 100,000 inhabitants are on average 36 km away from any given location, meaning that it is always possible to commute between them in a matter of hours. 82In some much-urbanized regions, such as Tamil Nadu, the average maximum distance to the nearest city is already only 6 km and will drop to 5.6 km in 2011. For 2011, we can expect 12.3 km for Madhya Pradesh (13.7 km in 2001), 9.2 km for Gujarat (10.2 km in 2001), and 8.1 km for Andhra Pradesh (8.8 km in 2001). 83We see that the main difference between the advanced States and the backward regions lies in their share of official cities with respect to the morphological agglomerations existing on the ground. 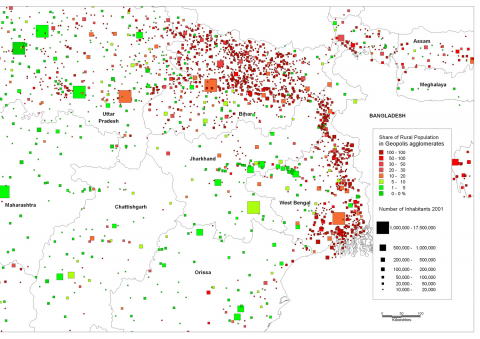 In Bihar, a State that appears very densely agglomerated, only 15% of the settlements having a population of 10,000 or more are officially designated as towns (Map 6). In comparison, in Tamil Nadu, 100% of the observed agglomerates are officially listed as towns, as are 67% in Maharashtra and 55% in Gujarat.22 This reveals the extent of the underestimation of the emerging agglomerates in backward states and the associated deficiency in governance. Bihar is a poorly governed State. For several reasons not yet clearly understood, and from previously observed trends in economic and political history, urbanization in relation to public infrastructures and services does not always cover the distribution of settlements or even support the trend of private investments. 84The question then becomes one of examining the distribution pattern of agglomerates all over the Indian Territory. Using the Nearest Neighbor Index23 based on the average Euclidian distance from each feature to its nearest neighboring feature, it is possible to have a first approximation of the aggregation level and trend of the urban system at the regional level. 85The aggregation level for all of India has been quite high for all settlements with at least 10,000 inhabitants: 0.60 in 2001 potentially improving to 0.58 in 2011. The estimated 3,197 new agglomerates that will have at least 10,000 inhabitants each in 2011 do not skew the current level of aggregation of settlements, thereby implying that some of them will develop with the existing metropolitan halo and emerging corridors. Of course, the level of aggregation becomes more random as the cohort of towns considered moves up from Class IV to Class I and finally to million cities, which had an index of 0.85 in 2001 for all India. 86In some regions, like Karnataka in the Deccan plateau environment, the level of aggregation appears lower than the average: with an index of 0.91 in 2001, the distribution is one of the closest to random, followed by Tamil Nadu’s 0.71, West Bengal’s 0.63 and Gujarat’s 0.55. The more dispersed distributions correspond to “rural” states like Bihar (0.86) but also to Punjab (1.03) with its long urban history and also its division after the Partition in 1947 (Grewal, 2005 & 2009). Historical structures of settlement distributions determined by a diversity of ancient territorial administrations as economic interlinks, commercial or/and temples itineraries and regional production specializations clearly reflect regional urban settings and can constraint their future. 87With the adoption of the Geopolis approach, central to which is the concept of the agglomerate as a contiguous built-up area, it has become possible to place the contemporary agglomeration process in India in a sounder perspective than has been the case. The Geopolis methodology is closely aligned to the United Nations recommendations related to analysis and comparison of urban dynamics worldwide. 88In the particular case of India, the Geopolis model of standardized data, verification on the ground, and digitalization of all morphological structures involved reveals the precise nature of the country’s urbanization: not what has been widely believed to be a kind of demographic polarization, but in fact a much-diffused process, with agglomerations of 10,000 or more inhabitants occupying 46,884 km2 or 1.6% of the country’s total area. Mega-cities and their satellites have been thriving under the impetus of economic liberalization. 89The Geopolis measure gives a global rate of urbanization for agglomerates with over 10,000 inhabitants as 37% in 2001 compared to the official rate of 27%. For statistical and political reasons, the tremendous proliferation of small agglomerations of between 10,000 and 20,000 inhabitants is hidden: this is a missing link in the national policy of planning and urban development. With the Geopolis interpretations, if the major and secondary city layers of over 100,000 coincide with the official ones, even differing marginally in relative terms, a significant feature of the finding is the strong emergence of the small-city layer of fewer than 20,000; its share more than doubled using Geopolis definition, from 19 million to 49 million inhabitants in 2001. 90At the same time, the group of Class I cities has grown larger, and 61 new agglomerates and 48 million potential urban inhabitants have been added. The dynamics of metropolitan agglomeration have been studied much more comprehensively and thoroughly, and bottom-level urbanization has been unveiled. 91With up-to-date satellite imagery, and based on the existence of 11,698 agglomerates with between 5,000 and 10,000 inhabitants in 2001 and the local urban growth rates of 1981, 1991 and 2001, we estimate that 1,052 new settlements will have at least 10,000 inhabitants each in 2011. Their 11.7 million inhabitants would have contributed to 9.5% of the absolute growth between 2001 and 2011. The degree of urbanization in the country would be around 42% in 2011. In 2011, the distance between agglomerates will be less than 10 km as the average maximum distance to the nearest town (in a polygonal subdivided space). 92In the context of the local and regional implementation urban decentralization (74th Constitutional Amendment Act of 1992), this alternative view of urbanization can be useful in examining the governance of Urban Local Bodies, since we consider that many states are much more urbanized than the official statistics would seem to indicate or at least have a higher share of agglomerates than is currently perceived. The exception is Tamil Nadu, where 100% of the observed agglomerates are included in the official Census list of towns, the other states recording between 14.7% (for Bihar) and 67% (for Maharashtra). 93On the other hand, the objectives of JNNURM—“to create economically, productive, efficient, equitable and responsive cities”—show close alignment with the national economic strategies, such as promotion of public -private partnerships in infrastructure development for million-plus cities and the SEZ policy of support for corridors as a “major emerging spatial pattern” (Centre for Policy Research, 2001). In respect to metropolises, urban public policies have led to a wide underestimation of the level of urbanization existing and emerging. For example, the Ministry of Finance in 2009 has estimated only 11.6% for 2026 the urbanization rate for Bihar (C. Vaidya, 2009, p. 10). Following the UN-Habitat projections, it also estimated that will India’s rate of urbanization reach 50% of its total population in 2026. Consequently, we stress that globally the trend of concentration of the urban population in large cities and agglomerations is clearly getting stronger (ibid, p. 8). 94As can be seen from their attempts to promote their own capital cities as major investment centers, the States command considerable clout in the matter of urban affairs. The country’s metropolitan cities bear witness to that power. It would be superfluous to add that such policies have led to a neglect of the secondary and small cities, which in fact represent a significant share of the urban dynamics of present-day India. A restructuring of the system of governance could be the most crucial element in a strategy aimed at reinforcing the country’s infrastructure and civic amenities and at attracting investment through public-private partnerships in order to participate more fully in India Inc. Such a strategy calls for support in the areas of sustainable development and education. 95As with elsewhere in the world, the responsibility for the policy of neglect that this study has uncovered rests squarely on the shoulders of researchers, geographers, sociologists, and economists, who have been focusing their attention on the top layer of the urban hierarchy and routinely cultivating a metropolis-biased vision in the context of globalization. World cities/global cities are grabbing their attention while the burgeoning common urban landscape, small and medium-sized, remains an unknown place. The ordinary city, the small and the medium-sized agglomerate where the growing majority of the world’s urban citizens live, deserves more attention. 96The preliminary results of the Indian’s Census 2011 are now being released. They indicate that the official Indian’s urbanization level remains very low: the official share of urban population gains 2.3 from 2001 to reach only 31.1% in 2011. The growth rate of the biggest metrocities continues to decline. Some corrections have been done regarding the bottom agglomeration with 2,774 census towns added, 362 in 2001 only (Kundu, 2011). These promoted local units in Kerala were counting for 47% of the official urban population in 2011. More than ever the extended urbanization is at stake and has to be studded precisely. 97What is needed, to begin, is a clearly defined agenda of research into the presently observed growth in small towns, how that expansion relates to the urban system, and how the two function vis-à-vis the new global division of labor, neo-liberal urban management and transnational investment (Satterthwaite and Tacoli, 2003; Bell and Jayne, 2009). The way in which some localities recombine local potential of development and mobilize or attract talents leading to clusters and innovations must also be documented. Creativity should not be a priori confined to major metropolises and monopolized by a “creative class” (Florida, 2002). A “glocal” encoding of innovation combining globally circulating knowledge and “traditional” knowledge can produce new economic values that are much more diffused than the extended metropolis halos have so far been seen to do. The value of such a transformation cannot be overestimated in the context of a labour intensive economy like India, where small town locations can support lower costs. Bretagnolle A., Pumain D., C.Vachianni-Marcuzo, 2007, « Les formes des systèmes de villes dans le monde » in Mattei M.F., Pumain D. (dir. ), Données urbaines, 5, Paris Anthropos 301-314. Denis E., (2006), Villes et urbanisation des provinces égyptienne : vers l’écouménopolis ?, ed. Karthala, col. Kalam, 440 p.
Florida, R., 2002, The Rise of Creative Class, New York, Basic Books. Kennedy L., 2007, “Shaping Economic Space in Chennai and Hyderabad. The Assertion of State-LevelPolicies in the Post-ReformEra”, Purusartha, (numéro spécial consacré à La ville en Asie du Sud coordonné par V. Dupont et D.G. Heuze), Editions EHESS, Paris. Mahavir, 1996, Modelling Settlement Patterns for Metropolitan regions inputs from Remote Sensing, ITC Publication, n°36, 191 p.
Moriconi-Ebrard F. (1994), Geopolis : pour comparer les villes du Monde, Economica, Anthropos, Collection « Villes », 246p. Moriconi-Ebrard F., Denis E., Marius-Gnanou K., (2010), « Repenser la géographie économique », Les arrangements du rapport de la Banque Mondiale avec les sciences géographiques urbaines », Cybergeo: European Journal of Geography, La Banque Mondiale et la géographie, mis en ligne le 20 mai 2010, modifié le 21 mai 2010. URL : http://cybergeo.revues.org/index23144.html. 5 Companies in free-zone enclaves are offered attractive incentives during the first five years of operations. These include freedom to export their entire output, and exemption from import license requirements, from customs duties on imports, and from taxes on profits. The exemption also covers indirect taxes and other central government and municipal levies, such as VAT and sales tax. For more details, see http://www.sezindia.nic.in/index.asp and Grasset and Landy (2007). 6 The minimum population for an agglomeration to qualify as urban is 200 in Denmark, 2,000 in France, and 10,000 in Greece. A uniform threshold such as Geopolis’ possesses obvious merit while comparing statistical indicators, e.g. rate of urbanization and number and density of agglomerations, within countries and among countries. Professor Mahavir, of the School of Architecture and Planning, New Delhi, in his dissertation on the Delhi Metropolitan Area (1996), advocates the adoption of the morphological agglomeration concept in India. 7 In order to identify and delineate the 6,485 morphological agglomerate’s polygons with at least 10,000 inhabitants, in 2001 we used a satellite imagery series of different sources and precision (Landsat 7, Ikonos…) from 1998 to 2005 – closer as possible from the situation in 2001 - and Google Earth professional tools supported by a Google - Tide Foundation’s grant. 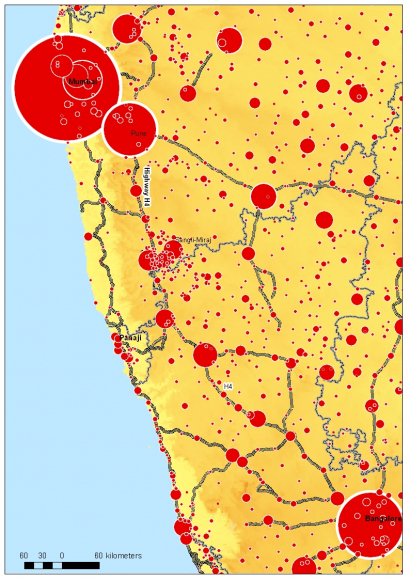 Using GIS, these set of agglomerates were crossed with a set of more than 104,000 coordinates of the official local units, towns and villages, with at least 2,000 inhabitants provided by MapMyIndia Company. This GIS procedure gives a list of the Local Unit components by agglomerate. The sum of Local Unit Populations provides the total population by agglomerate; their share of urban and rural population is also generated, as is the share of their central and peripheral population... This geodatabase authorizes a detailed comparison with the official urban figures. The polygon acquisition was extended to all morphological units with at least 5,000 inhabitants in 2001 (more than 11,900 local agglomerates) in order to project the agglomerate’s landscape of units with at least 10,000 inhabitants in 2011. Finally, all components of the agglomerates with at least 5,000 inhabitants in 2001 compose a landscape of some 18,400 verified agglomerates (6,485+11,913=18,398). In 2001, these agglomerates were incorporated within their continuous built-ups of some 29,370 local units. The population of these 29,370 units was traced in Census archives in Delhi from 1961 (1961, 1981, 1991 and 2001 census) and harmonized regarding name and boundary changes (notably as a subdivision of local units) in order to be able to trace the population growth with constant morphological limits of all agglomerates composed of towns and villages with more than 5,000 inhabitants in 2001. The analysis of temporal dynamics is not the aim here. 9 This definition was introduced in 1971. The 1951 Census classified as urban all areas that had municipal corporations, were designated as municipal areas, had town area committees, were civil lines not included within municipal limits, or had cantonment boards. However, perhaps under local political pressure, application of the definition was left to the sole discretion of the States’ officers. In 1961, the notion of Census town was introduced with the following minimum criteria: (a) population density of 1,000 per square mile, (b) population of 5,000, (c) three-fourths of the working male population working outside agriculture, (d) possession of urban characters or amenities, attributes left to the discretion of the States’ Superintendents. The lack of consistency evident in these definitions has caused difficulties in studying the trends in urbanization, particularly during the period 1961 to 1971. 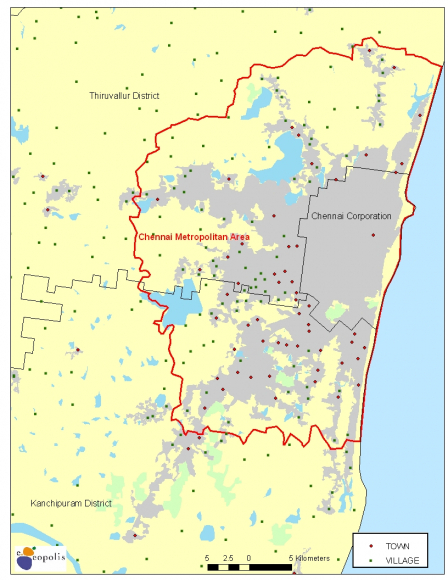 11 The UA concept was introduced in the 1981 Census, following the Standard Urban Area concept of 1971, which replaced the Town Group definition used in 1961.
iii) A city or one or more adjoining towns with their Out Growths all of which form a contiguous spread” (Census of India, 2001). 13 The 73rd and 74th Constitutional Amendment Acts were introduced in 1992 in a bid to achieve democratic decentralization and provide constitutional endorsement of local self-government authorities. These amendments confer authority on legislatures of States to endow respectively rural panchayats and Urban Local Bodies (ULB) with such powers and functions as may be necessary to enable them to act as institutions of self-government. For this purpose, rural panchayats and ULBs have been charged with the responsibility of preparing and implementing plans for economic development and social justice. The central objective of these amendments is the decentralization of planning and decision-making procedures. They also have the implicit intention of removing centralized control and monopoly over the collection and distribution of resources. 12) Promotion of cultural, educational and aesthetic aspects. 14 Total population of India within the country’s current borders (excluding Pakistan, Bangladesh and Burma/Myanmar). 15 The official Class I has been split into two sub-classes: one of 1 million or above (the so-called “metrocity” in India) and the other of up to 1 million. 16 The official rate of urbanization was 27.8% in 2001, including 1,066 towns with fewer than 10,000 inhabitants, the smallest one having only 338 inhabitants (191 statutory towns have less than 5,000). 17 16 The Mahatma Gandhi National Rural Employment Guarantee Act aims to enhance the security of people’s livelihood in rural areas by guaranteeing one hundred days of wage-employment in a financial year to a rural household whose adult members volunteer to do unskilled manual work. 18 The talks initiated in December 2009, under strong political pressure, to divide Andhra Pradesh between Telangana with Hyderabad as its capital and coastal Andhra with Vishakhapatnam as capital are to be viewed in that perspective. 19 Geopolis projections are based on the methodology that proved its reliability worldwide in the prediction of 2000 round census. Its key features are as follows: 1) The natural growth for the last Census interval 1991-2001 is calculated for each urban unit (The series of the district’s urban natural growth given by the Registrar General & Census Commissioner, India, for 1996 has been used). 2) The migrant proportion of the 2001’s population for each urban local unit is then calculated. 3) Using 2006 set of data for natural growth, the natural growth is calculated for 2001-2011; to this figure is added the constant number of migrants from the previous Census interval to arrive at the estimated population for 2011. (4) The area and the number of local units are considered constant, based on the extent of the contiguous built-up area of 2001. The method considers the changes in fertility and mortality as given by variations in the natural growth and presupposes constant in-flows and out-flows of migrants. In the Indian context, the hypothesis of constant flows of migrants in both directions is validated by migration studies, recent Census series and the National Sample Survey data (2008) showing a stable trend of migration toward the cities (See Chandrasekhar, 2010). 20 Shaw and Satish (2007) present a different picture of the distribution of the FDI and domestic investments among the metropolises, giving less importance to Delhi than to Mumbai and Bengaluru. However, it must be noted that their ranking only relates to industry. Moreover, the database used, CAPEX, came from a private company named CMIE and only covered ‘new and ongoing investment activities in India.’ Because it contains data on partly realized and non-realized projects, care should be exercised in relying on their findings and interpretations. 22 Note that most of the Census towns are just towns on the census list, as this categorization is rarely followed by any changes on the ground. Very few are promoted as town panchayat with the legal delegated competences, budget and local elected committee; they remain under the rural administration. They also stay rural in the sense that services are not improving. 23 The nearest neighbor index is the ratio of the observed mean distance to the expected mean distance between any two points in a cluster. The expected distance is the average distance between neighbors in a hypothetical Poisson random distribution. If the index is less than 1, the pattern exhibits clustering; if the index is greater than 1, the trend is toward dispersion or competition.